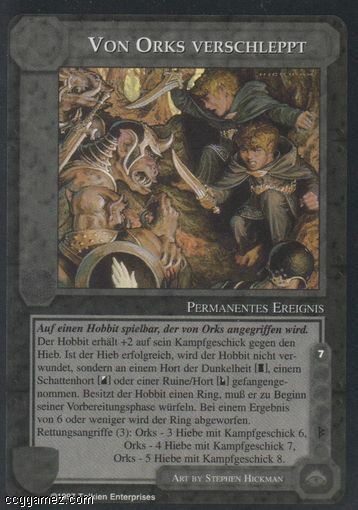 Tekst Playable on a Hobbit facing a strike from an Orc attack. Target Hobbit receives +2 prowess against the strike. If strike is successful, he is not harmed and is taken prisoner at a Dark-hold [D], Shadow-hold [S], or Ruins & Lairs [R]. If the Hobbit bears a ring, his player makes a roll at the start of each of his untap phases-if the result is less than 7, discard the ring. Rescue-attacks (3): Orcs-3 strikes with 6 prowess, Orcs-4 strikes with 7 prowess, Orcs-5 strikes with 8 prowess.